(October 14, 2010) --- As John Lennon once sang, "Instant Karma's gonna getcha." But for Brett Favre that karma came in the form of a football. 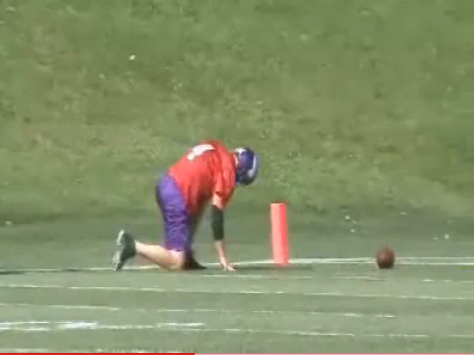 During yesterday's Minnesota Vikings practice, Favre tried to be Mr. Fancy Pants One-Handed Grab, but he failed to catch the ball and subsequently got clobbered in the frank and beans. The good news: he's not feeling the pain in his arm anymore. So, if you would like to see Brett Favre get hit in the MVPP, click here. Down goes Favre! Quick! Someone call Bob Saget so he can award Brett Favre this week's $10,000 prize!